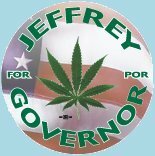 Please Consider a $10 Contribution Scott Jeffrey needs your financial support. 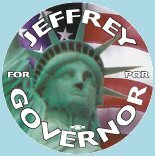 Running for governor is a statewide effort and as active as Jeffrey is campaigning, he can only meet so many voters one-on-one. Advertising will be key to success. Every ten dollars makes an enormous difference, so please consider making a small contribution. All contributions must include your Full Name and Address. Checks and money orders are prefered over cash and are required for any donation of $100 or more. You must be a U.S. citizen to make a donation. All donors who contribute $10 or more receive a pair of campaign buttons as thanks! We've Already Raised $2000 Thank you everyone who has given. Together we are getting our pro-liberty message out!